If there was any doubt whatsoever that the styling of the new 1961 Lincoln Continental was approaching perfection, the announcement that the stylists who created the 1961 Lincoln Continental were the recipients of an award for excellence in design from the Industrial Designers' Institute laid it to rest. The new Continental was a shock to the senses when it appeared on America's boulevards in late 1960. After the excesses of the fifties, where bigger was better, more chrome was best, and if it wasn't outrageous it wasn't any good, the new Continental cleared away all the fog and allowed the sun to shine down on a car that would have a major influence on the American luxury car market for the rest of the decade. Styling wasn't the only area where the Continental changed the standards. Previously, most luxury cars were built to the same standards of quality, but the 1961 Lincoln Continental was designed and built to a new set of standards that were intended to provide reliability and durability far superior to other luxury cars. In fact, Ford Motor Company was so confident in its new Lincoln that it offered a 2-year or 24,000-mile dealer warranty on the car, twice that of any other car. The traditional 1,000-mile new car oil change and adjustments were not required on the Continental, it was ready for normal driving on delivery. Under normal operating conditions, twice a year or 6,000-mile service was all that was required. This service interval was exceptional at the time, and a direct reflection of the design and build quality of the car. The carefully attention to mechanical tolerances resulted in improved performance and improved fuel economy—10% better than the 1960 Continental. The Continental's exclusive new size was unique in the luxury field, and represented an almost 15 inch reduction in overall length, and 1-1/2 inches in width which was appreciated when maneuvering in traffic, garaging, or parking the car. Steering effort was reduced by 25% and start-up acceleration was 11% faster, both results of a more compact size and less weight. Despite the reduction in external dimensions, interior space was still fairly generous, as expected of a luxury sedan at the time. In fact, front seat room was almost identical to the larger 1960 Lincolns—and the driver's leg room was actually increased slightly. Lincoln was quick to point out that even though the new Lincoln was the shortest luxury car, it was also the heaviest, which resulted in a smooth, stable, quiet ride with predictable handling. Owners of the new 1961 Continentals were so delighted with their purchases, they held on to them longer than they normally would have. The compact size made the car a joy to drive. It was easier to maneuver in and out of tight garages, and small parking spaces that would have been abandoned in a larger car were no problem for the new Lincoln. The one complaint from owners was the lack of space in the rear seat. This is where the more compact dimensions of the Lincoln showed their limitations. The 1961 Lincolns also had other limitations, as in limited models. 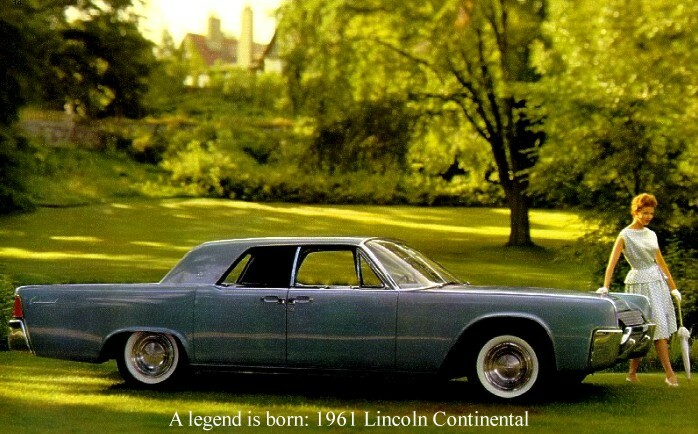 Previously, Lincoln had sought to compete with Cadillac almost on a model by model basis, as well as size. The 1958-1960 Lincolns were huge cars, that were thoroughly tested and well built, but didn't sell as well as expected. 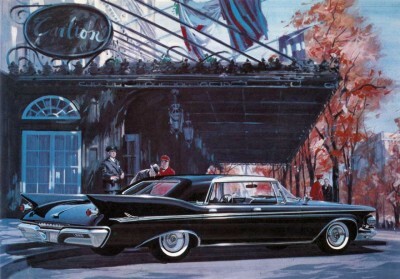 For 1961, Lincoln made a strategic marketing move to improve the quality of its cars so that new owners would immediately see and feel the difference, as well as limit the number of models offered. Originally, a 4-door sedan, 4-door hardtop, and 4-door convertible were envisioned, but the 4-door hardtop never went into full production, leaving just two models. This limited offering of models spoke of quality and exclusivity, as with just two models more attention to detail could be afforded, and Lincoln was quick to mention that there were no "less expensive" versions of its luxury cars. Another part of Lincoln's new marketing strategy was to include a higher level of standard equipment at the base price. Most luxury car buyers expected certain amenities and accessories, and ordered them if they weren't provided as part of the base package. Lincoln cut costs by including many of these things as standard. 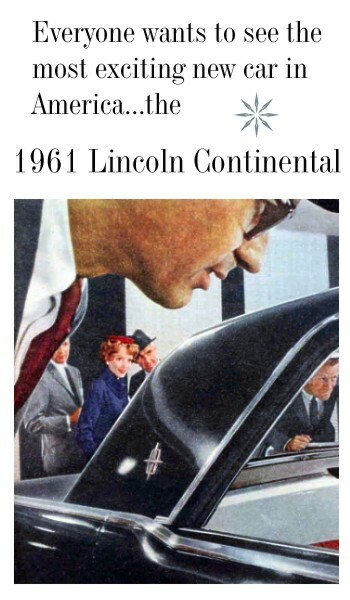 In 1961, you could not purchase a new Lincoln without power windows, a six-way power front seat, AM radio with rear seat speaker, white sidewall tires, heater and defroster, or front and rear seat center arm rests. Cadillac charged extra for these items on some of its models, with the higher priced series including more equipment. Lincoln had made its point, however, as less expensive versions of a luxury car tended to dilute the prestige of the line to some degree. How serious was Lincoln about the quality of its new car? Very. Every engine was bench tested to an equivalent of 90 miles per hour before being broken down for inspection, re-assembled, and tested again after it was installed in the engine compartment. Each electrical component was individually tested to determine if it was drawing the appropriate amount of current, and the entire electrical system was tested again once all the individual components had been installed. Power window motors had stainless steel shafts, and were dipped in liquid rubber to waterproof them. Generators were put through a running test before installation, as were radios. Both were tested yet again after installation. Inspections were performed all along the assembly line, and these inspections were on components that had been tested before they were shipped to the factory. Once the completed car was finished, a factory trained inspector drove each car over a 12-mile test course, on actual roads in the Wixom, Michigan area. When this inspector approved the car, he knew the cigarette lighters worked. He knew the power windows and seat operated as expected, that the heater and defroster performed as they were designed, and that the fit and finish of the car met Lincoln's high expectations. He knew because he personally tested all of these things during his drive. Cars that failed in any area were returned to the factory, repaired, and then had to pass the inspection process again before being approved for shipment. To see the impact the new Lincoln had on the industry, one only has to compare other 1961 models to comparable 1963 models. Considering a two year lead time to modify a design, the impact first appeared around 1963. 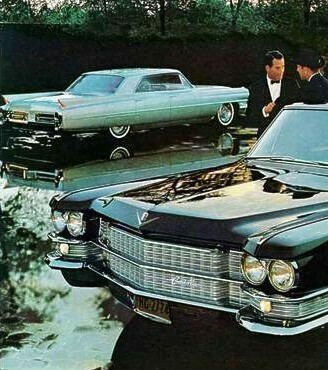 Take a look at a 1961 Cadillac, and compare it to a 1963 Cadillac. See the difference? Heavy body side sculpturing has been eliminated, and the tail fins had begun to shrink considerably. 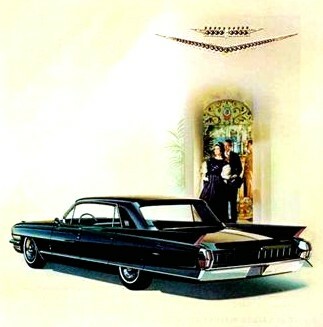 The same thing holds true for the 1961 Imperial in comparison to the 1964 Imperial. The comparison doesn't stop with just luxury cars. Look at the 1963 Chrysler, 1963 Buick, or almost any other 1963 model. Sleeker, cleaner designs with smaller fins, less chrome, and fewer sculptured body panels were "in." The 1961 Lincoln Continental offered 21 different exterior colors, all of them acrylic enamels for maximum durability, shine, and ease of maintenance. Inside, customers could choose eight different colors for standard upholstery, which was a Nylon Net Cloth with matching metallic-finished leather for the seat bolsters and center armrests. Three shades of wool broadcloth were also available for customers who preferred a more traditional material. Leather was optional on Sedan models and standard on Convertibles, and came in eight colors, two of them two tones. Convertible tops were offered in black or white, both with black interior linings, and were available with all color combinations.